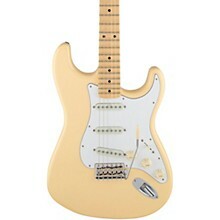 The Fender Yngwie Malmsteen Stratocaster has been updated to be more like his current number-one Fender! 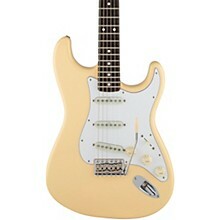 Updates include a White /Black/White pickguard, bullet truss rod nut and machine screw neck mounting! This neck mounting method provides a better connection and overall tone transfer to the guitar body. Like the original Yngwie Strat, this amazing axe features a solid alder body, modern "C" shape maple neck, and Yngwie's signature scalloped maple fretboard with Dunlop 6000 Super-Jumbo frets for a playing experience as fast as you are! The pickups are all Yngwie tone, too! All three pickups are Seymour Duncan YJM Fury . Switch pickups with a 3-position blade and make it wail with the American Vintage Synchronized Tremolo bridge. The brass nut provides a bright sound you can't get any other way. Made in Fender's Corona, California factory. Includes case.